The perfect tee isn't a myth. 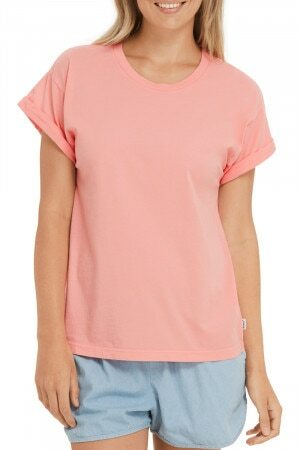 It's made from Home Grown™ Aussie cotton, a premium cotton that's super soft and comfy, lovingly farmed in Australia. Born where its worn, Bonds Tees are designed to fit you to a tee. Roll on in our relaxed fit, crew neck tee complete with rolled cuffs. With a low hip length and a straight hem, it works effortlessly into your everyday wardrobe. The Roll Up Tee is rated 4.3 out of 5 by 35. Rated 4 out of 5 by Chole from This is great sizing. I am an 18 and the xl fit nicely. Good length too. The only criticism is that I would have liked the cotton a little thicker. It seems a little flimsy but still ok. Rated 5 out of 5 by Hugs4Bugs from Perfect colour style and size. I was happy to hear that my daughter (who is 42 years my junior) thought this about the purchase I made for her birthday! Rated 4 out of 5 by Trudy53 from I love the fabric in the roll-up tee. I'm very happy with my roll-up tee. It's very comfortable and a good fit. Rated 4 out of 5 by Mags from Very comfortable to wear. Recent purchase so only washed once and one only worn - actually as I write! Very soft, good fit as I don't like things too "fitted". Colours are true to image shown. Being cotton, albeit very soft cotton, you need to wash on gentle cycle and hang immediately, stretching lightly to shape to avoid creasing - I hate ironing! Being an "oldie", I would like to see some elbow length sleeved tops. Perhaps something for Bonds to consider. Rated 3 out of 5 by VMars04 from Comfy and great colour, not very durable I bought this exact shirt about 12 months ago and it was comfy and looked great. A couple months ago it start to get holes in the bottom the shirt. Was happy enough with the colour and style that I bought it again, but only because it was on special. Would not pay full price for this item or other bonds shirts. They do not last. Rated 5 out of 5 by cc811 from I LOVE the roll tee. I have it in charcoal marle, blue, white and black stripe and soon purple. I love that the cotton is thick with not too much stretch so it drapes nicely without clinging. 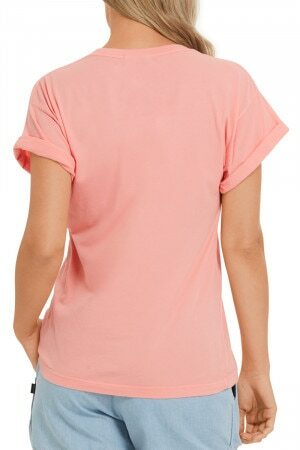 The cut is perfect and the roll sleeves are a flattering length. I hope they keep making these in different colours. Rated 2 out of 5 by Bunsen87 from Super comfy HOWEVER the sleeves always unroll. The sleeves needs to be secured with extra stitching. And even when I dry the shirts flat or hanging on a coat hanger, they always dry wrinkly. No idea why? Rated 5 out of 5 by Leisa from Thick, soft and perfect fit I brought this a few weeks ago to replace my old faithful white bonds tee and I am loving it so far. The best thing is that it is thick so you can’t see through like most other white feet.